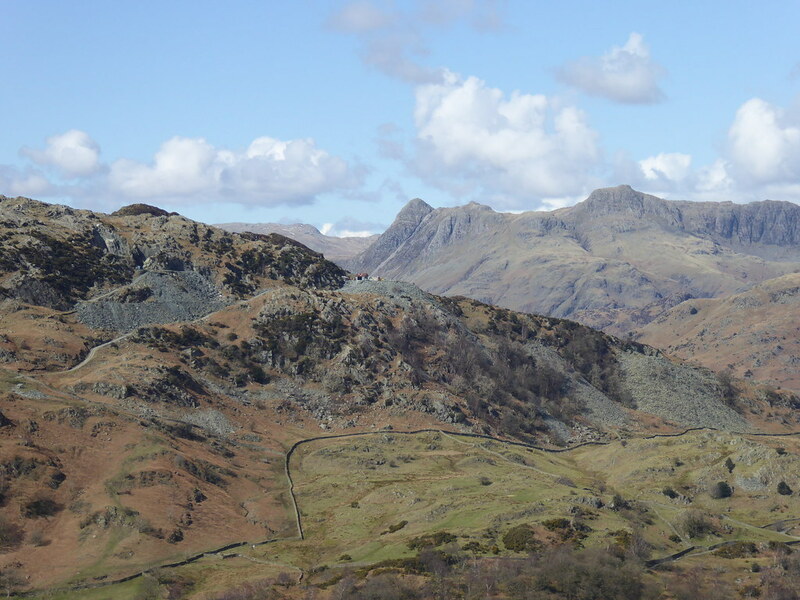 A day of peripatetic bagging in the eastern and central Lake District. This trip was a shameless one for bagging. Three Marilyns in this case. 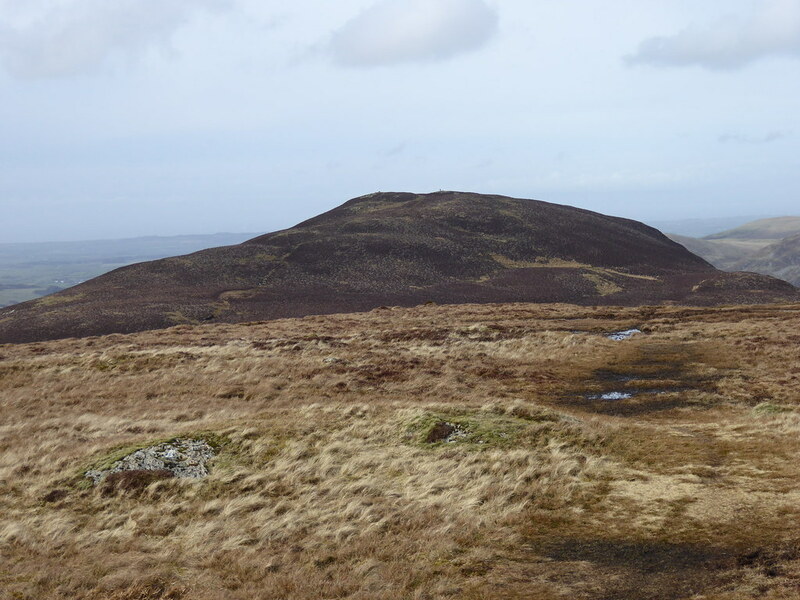 The first was Grayrigg Forest, a hill at 494m (1,621ft) that stands just west of the M6 and Kirkby Stephen. The weather did not look too promising as I descended over the Pennines into thick fog. I drove parallel to the M6 south from Tebay and turned up a no through road at SD 607015 where there was parking just before a gate. It was a pleasant enough start in the gloom as I went 500m along a narrow continuation of the road. Sheep loomed out of the grey. I then turned left (south) and commenced the climb first over close cropped grass and the later over rougher ground as the slope steepened. There was a wall to cross and the sheep were left behind. As I continued up to the west of Birk Knott the atmosphere became lighter. Not too long later I was emerging above the fog with blue sky above. Eventually near the wall running from Birk Knott I found the faint trace of a vehicle track. I followed that for a short while and then broke to my right on to the plateau-like top where the trig stood proud at the far end. Snow covered hills lined up along the western arc. The sea of mist swirled beneath with some communications masts popping through on nearby bumps. To the south east the Howgills were prominent. The air was still but still a little chilly. I stayed perhaps 15 minutes and walked back down into the damp cloud. Next on the agenda was Claife Heights, somewhat lower that Grayrigg Forest at 270m (886ft). This hill is located in a quieter part of the Lake District on the western side of Lake Windermere, more or less opposite the town of Windermere itself. This required a drive around the north end of the Lake through Ambleside to a car park at Red Nab. There was still mist over the Lake when I left the car. 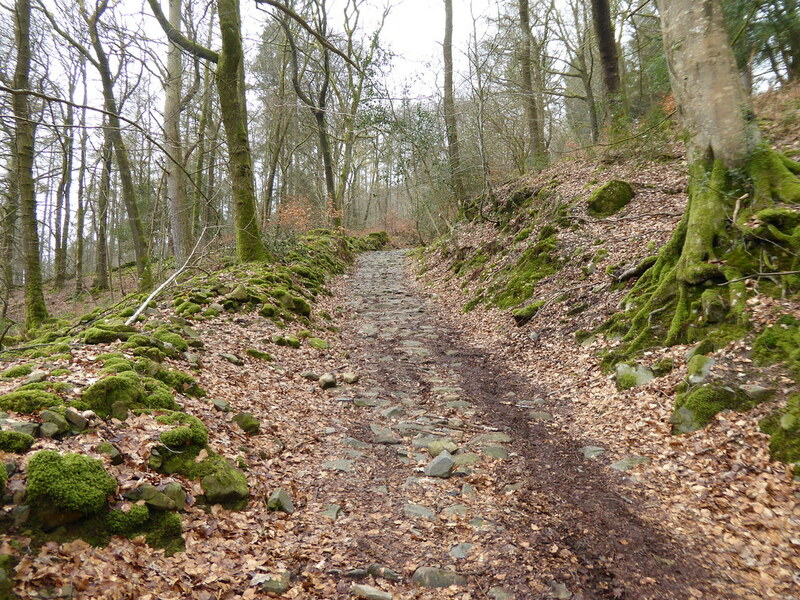 A private road continued to Belle Grange from where a bridleway headed up west. This provided a pleasant wooded approach. I then turned south at its junction with the footpath signed to Far Sawrey. From here there was quite a bit of forestry activity with trees fallen across the path and the path was quite wet. This was as a result of the storms that had hit the Lake District particularly hard. 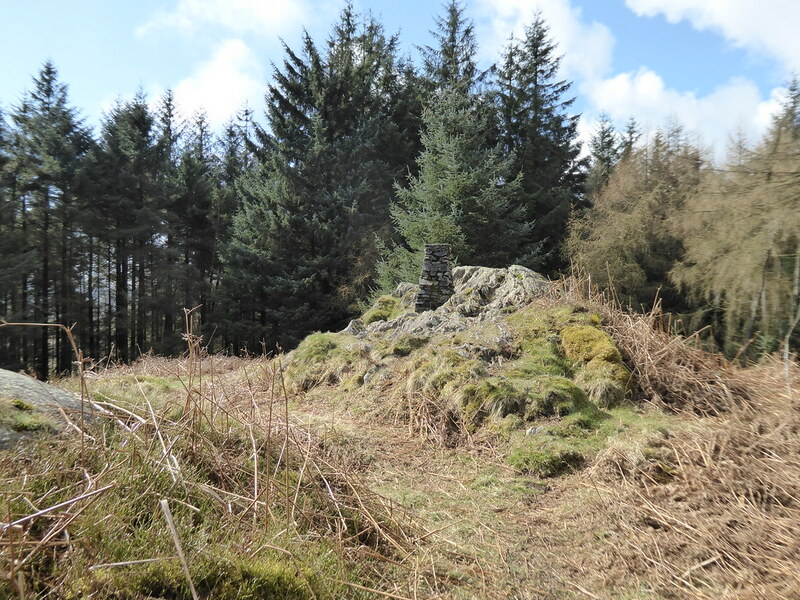 Eventually the path passed through a wall and there were some more trees to hurdle before a final short rise to the clearing in which the trig point and summit rocks. Being surrounded by trees there is no real view from here. But it was pleasant sitting in the sun with the fog having by now lifted and broken up. This is a quiet hill, at least in its upper parts and I just saw one couple at the top. I returned by taking the footpath to the forestry road to the north. I followed this to its junction with the bridleway back down to Belle Grange. This was very wet for a while but it got a lot better as the gradient increased back down to the lake shore. Finally there was a short hop west to Holme Fell. 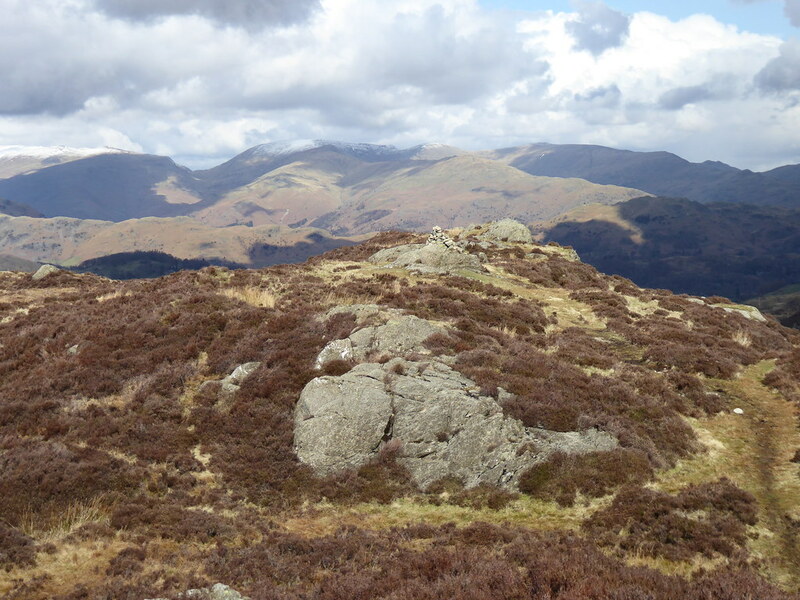 This is another diminutive hill at 317m (1,040ft) but it packs a punch in terms of views with the length of Coniston Water together with the Coniston Fells spread out to the south, the Langdale Pikes to the north west and Helvellyn and Fairfield to the north and east. I started from Holme Ground, up to the bridleway and followed a path up just beyond a gate. This led, more or less, to the summit. I visited the three bumps in the summit area, the southern one (the true summit) with the best view along Coniston Water. I went back the same way – a 50 minute round trip. Not much effort for some superb views. 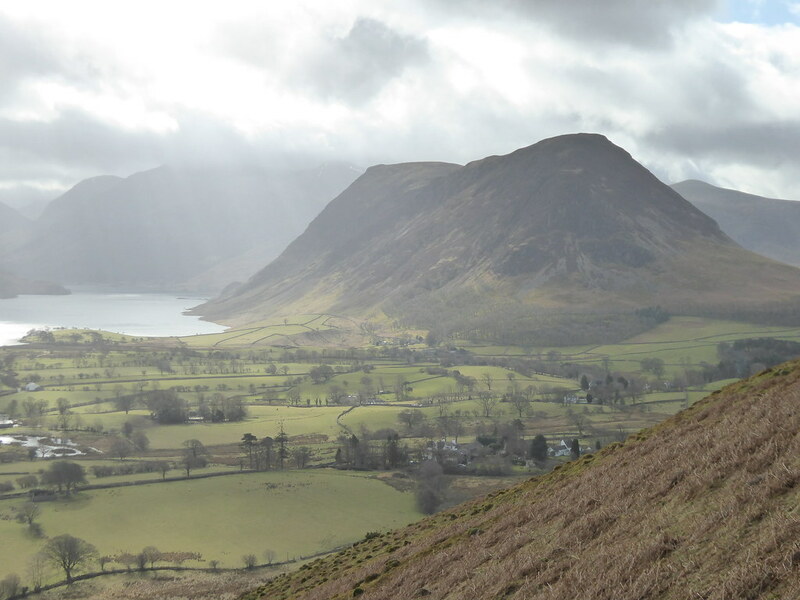 Loweswater is little outside the Lake District honeypots, so sees less footfall. It is located west of Keswick and, having three Marilyns scattered in the vicinity, it was a suitable hunting ground for me. The weather was forecast to be bright and breezy and I arrived in Loweswater village at the early hour of 8am. I was able to find a car parking spot by the phone box in the village. 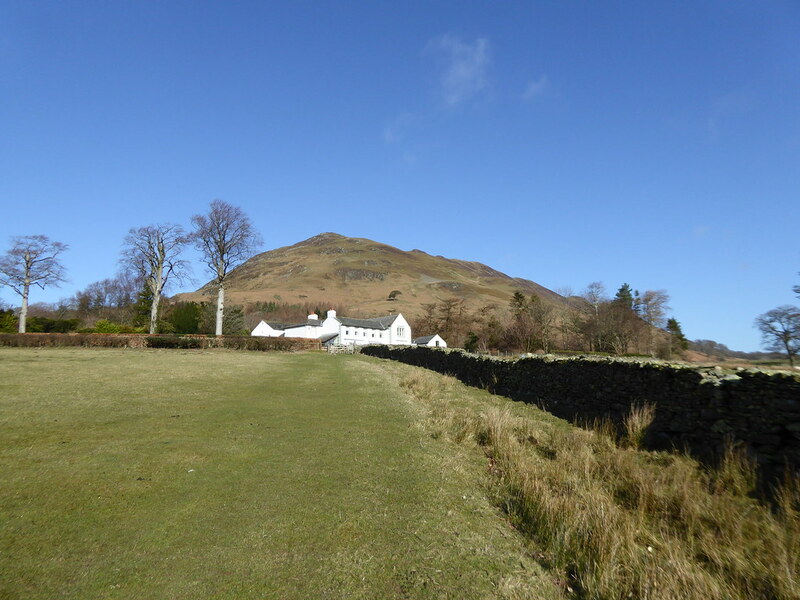 First up was Low Fell at 423m (1,388ft), seen here from the approach across the fields. Then the view north west towards the sea. 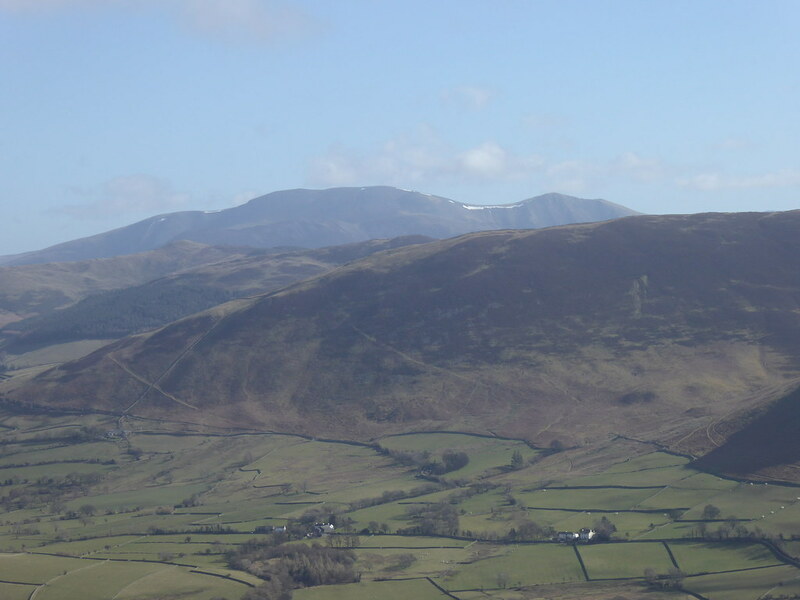 And the view east towards Skiddaw. And now to Mellbreak, which would be my final hill of the round. On the way down I followed a fence line a little to the south before re-entering the woodland. 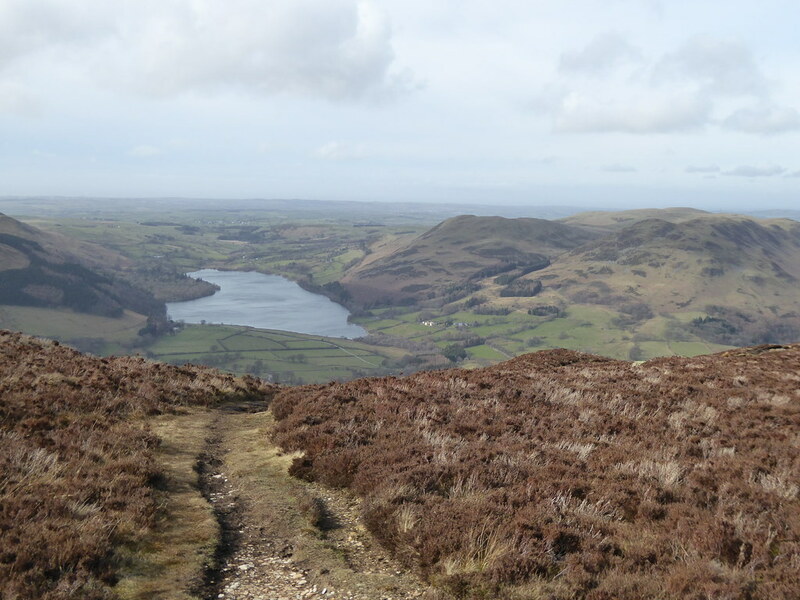 At Foulsyke I followed the road south west and then dog legged along the road to the car park for Loweswater and thence to High Nook Farm. 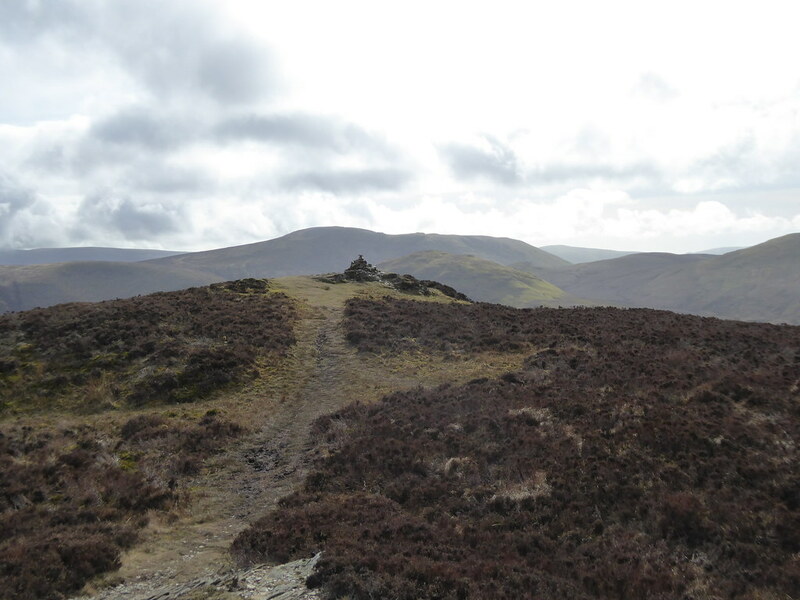 The path takes you up on to the fells above, though disintegrates a little as the higher ground is reached. 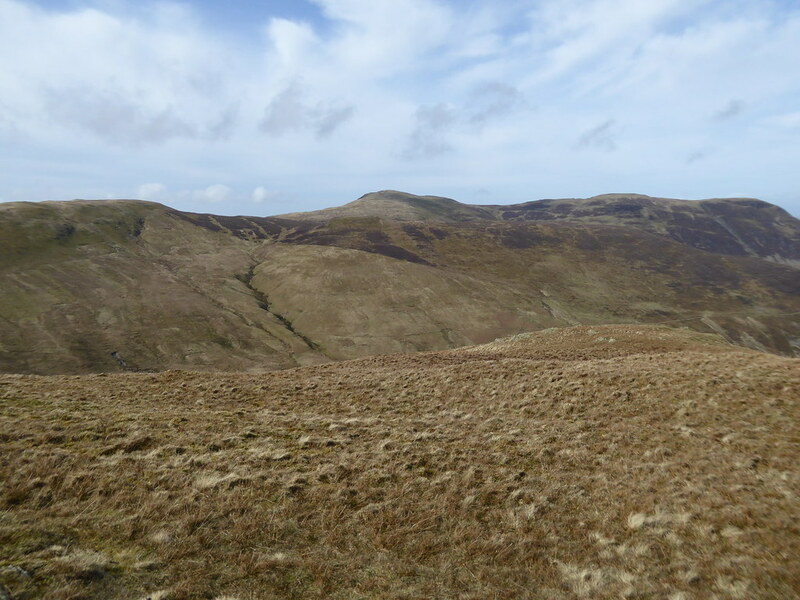 I arrived at the col between Blake Fell (the next objective) and Gavel Fell and turned right. 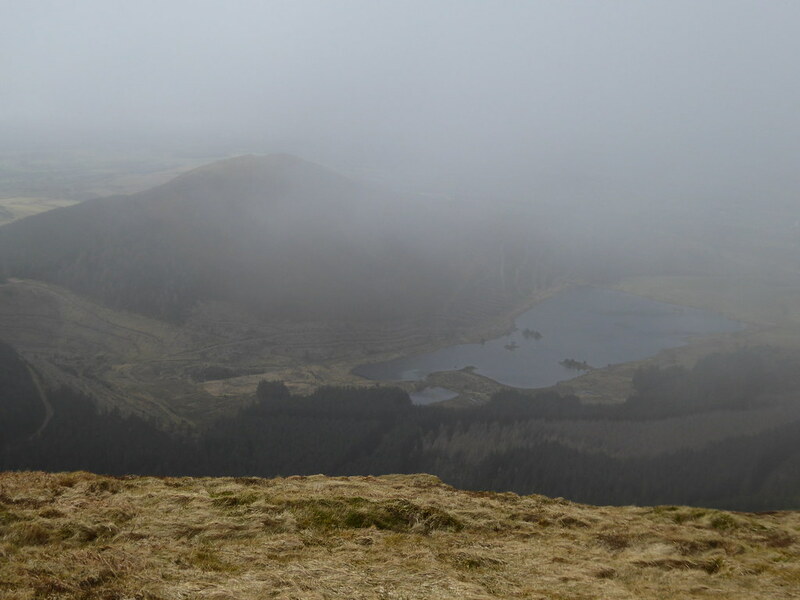 Unfortunately the cloud came down and views from the 573m (1,880ft) Blake Fell were limited. Here I am looking down to Cogra Moss. Jet didn’t look too impressed with the conditions. 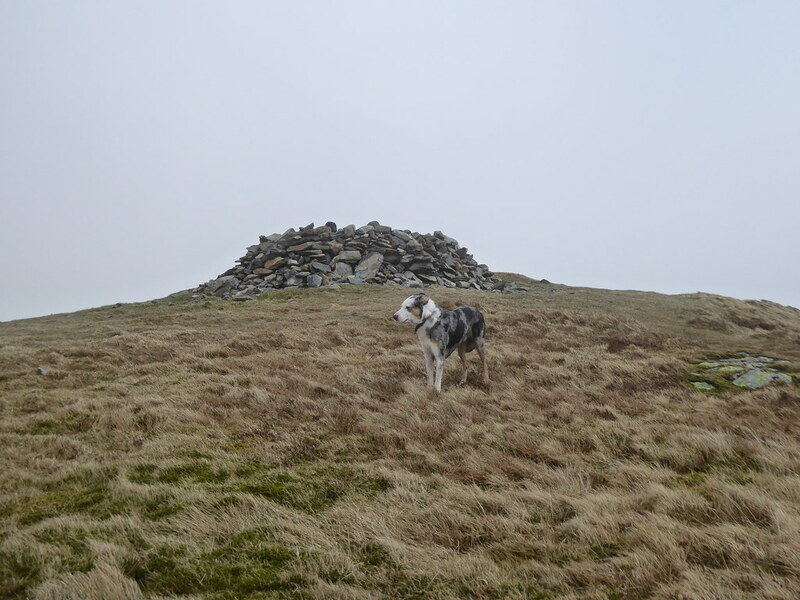 I didn’t stay long, it was too cold and the shelter within the cairn was occupied. 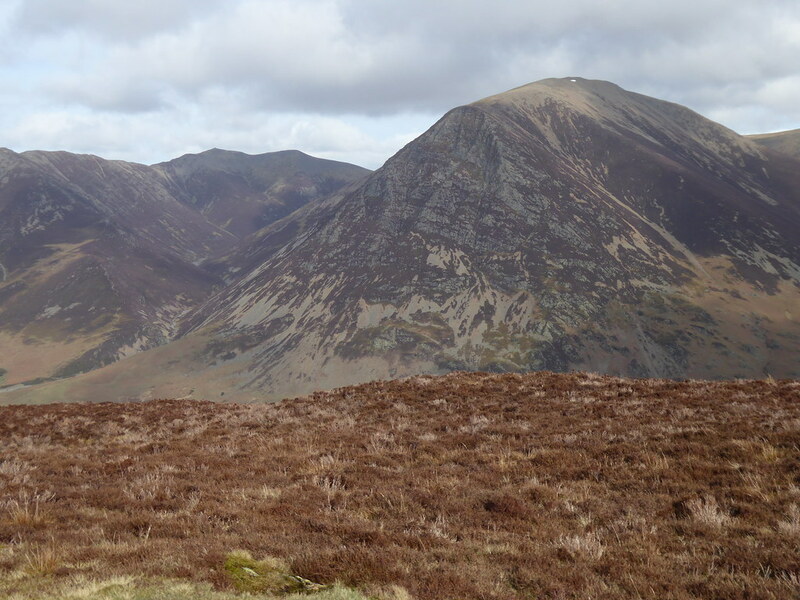 So it was back down to the col and up to Gavel Fell, not a Marilyn but a Wainwright. The grass by the cairn was short cropped and dry so I sat down for a bite to eat, back to the wind, willing the clouds to lift. The clouds obliged but not until the route across Whiteoak Moss was being started. This is a featureless boggy morass. My recently treated boots stood up to the wet and ooze as we headed for the interestingly named Hen Comb, another Wainwright. It did not look much like a hen’s comb from my angle of approach. Perhaps it does from the valley. I aimed to its right and joined the base of its south slopes. The ground dried out and a pleasant short steep rise took me to the top. 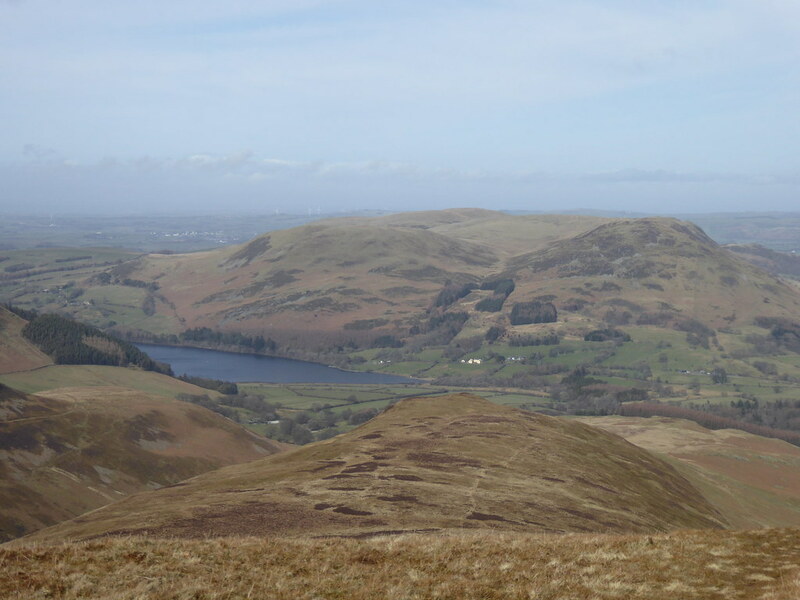 From here I looked back to Blake Fell and Gavel Fell. 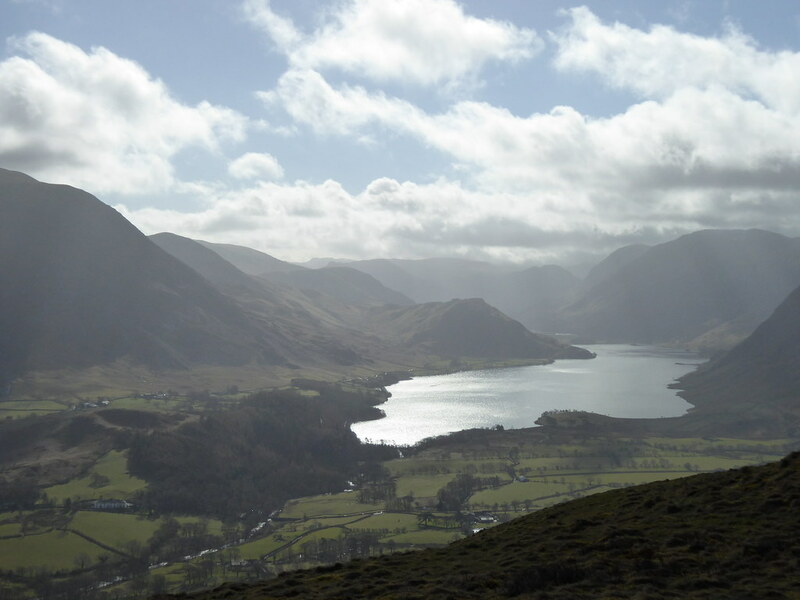 Buttermere and Fleetwith Pike were now visible. 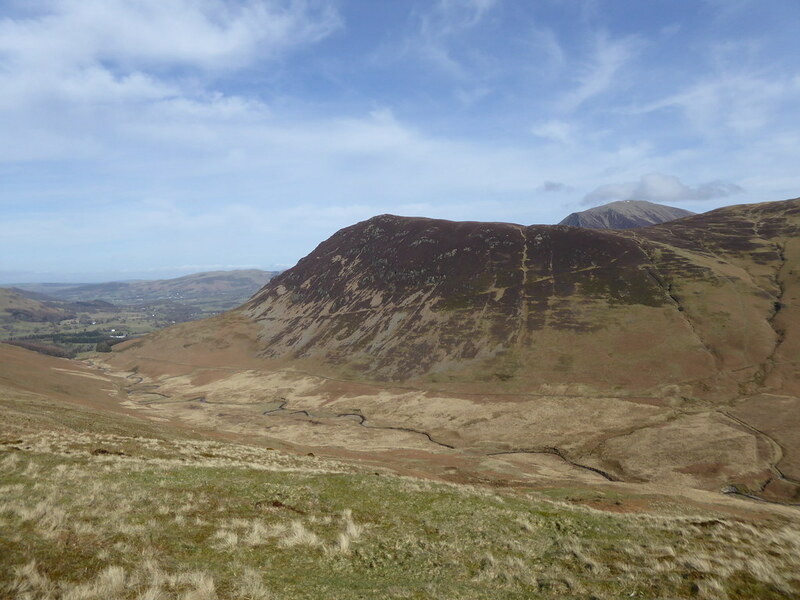 And this was the view to Low Fell and Loweswater. 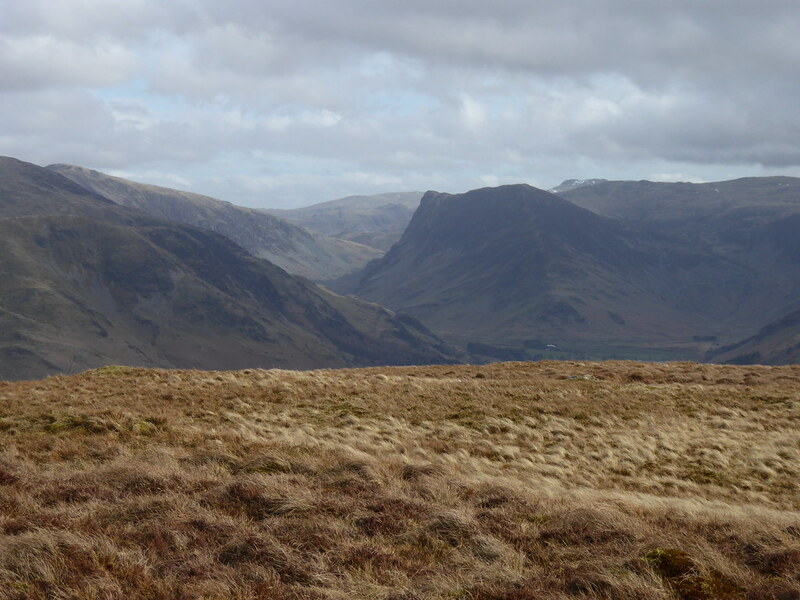 The way off was north for a couple of hundred metres and then down the steep eastern flank of Hen Comb into Mosedale. Across the way was Mellbreak. In the photo above you can see a line slanting down from right to left. This is Todd’s Trod and was the route down. The way up was another straight up step way. I stopped briefly at the foot of the climb for some more to eat. Reaching the ridge I visited both tops of Mellbreak. 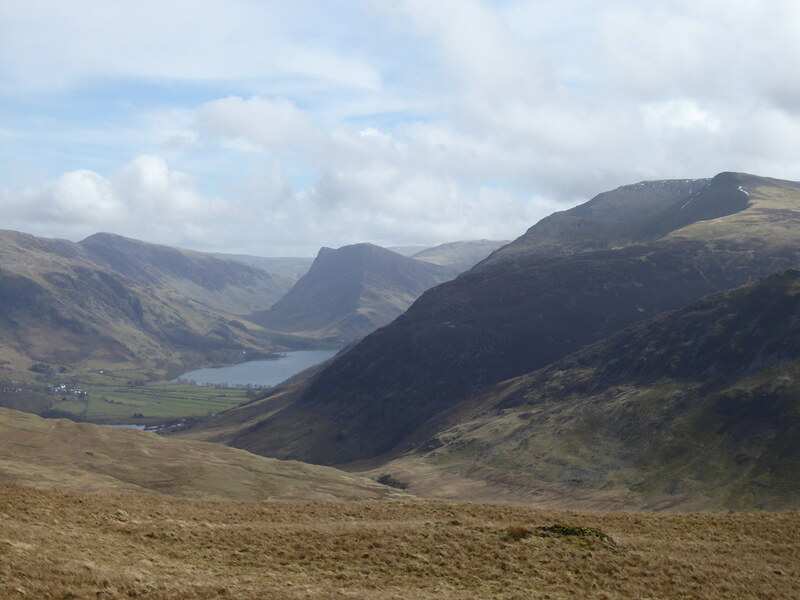 First the higher south top from where Buttermere, though not Fleetwith Pike, was hidden. The northern top looked higher. It was certainly more aesthetically pleasing. And Grasmoor dominated to the east. There is way off down the north nose of Mellbreak but it looked craggy and I was uncertain as to how Jet would cope. 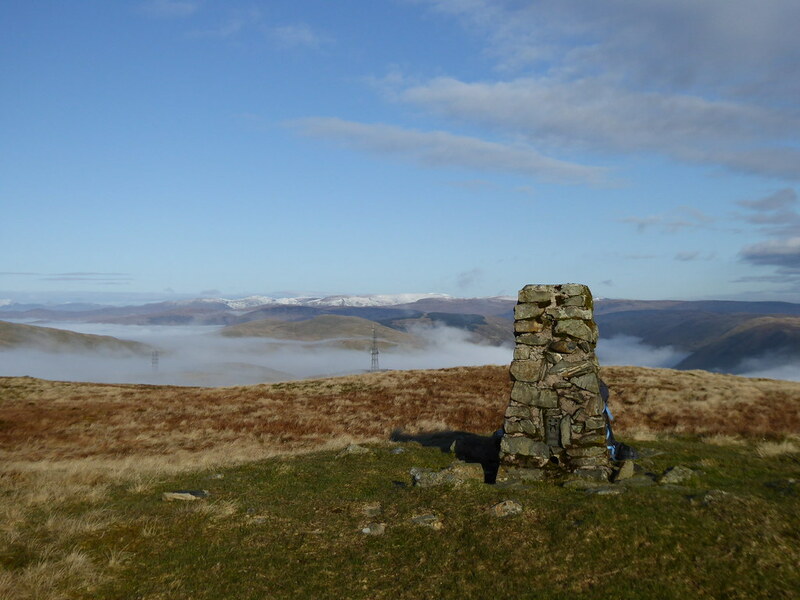 So it was back to the dip between the two tops, down the way I had come up for a two hundred metres or so and, by a small cairn, via the turn off for the Trod. You could see why Todd (whoever he was – a local shepherd?) had created this way. It led at an easy angle downwards crossing the occasional scree shoots to the fields at the northern base of the hill. Here the path down the nose was intercepted and continued through a further small piece of woodland before joining up with the public footpath to Loweswater village via Kirkgate Farm where the farm dog came out to greet us. So it was a very nice 18k (11 mile) walk with around 1,350m (4,400ft) of ascent taking about 7 hours including stops. That was not it for the day though. There was a fourth Marilyn to bag, an isolated hill to the west called Dent. 40 minutes up and 30 minutes down. It was a bit of a lump. The Coast to Coast path goes over it, but that is about all one can say about it. 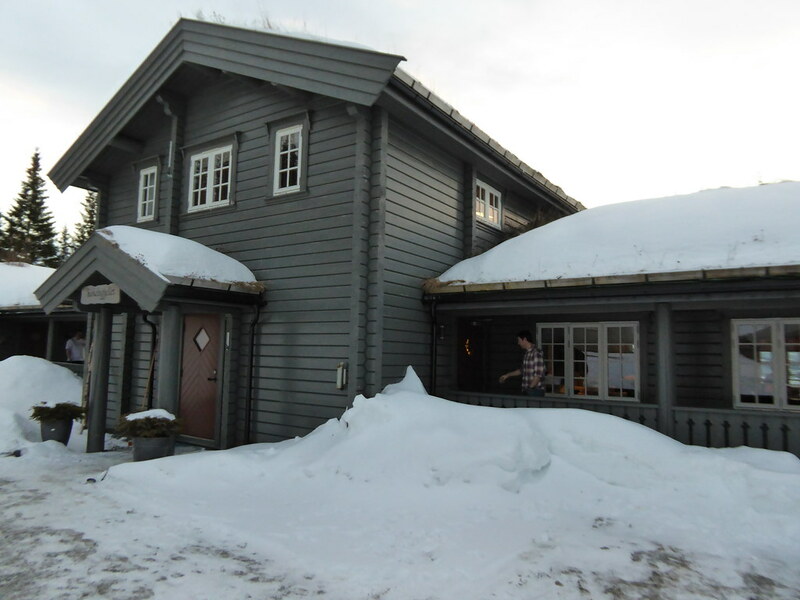 In February I went to Norway. 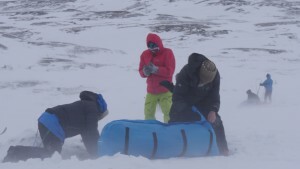 The purpose was to experience camping on snow, pulling sleds (or pulks) and engaging with cold and/or extreme weather over a three day journey. 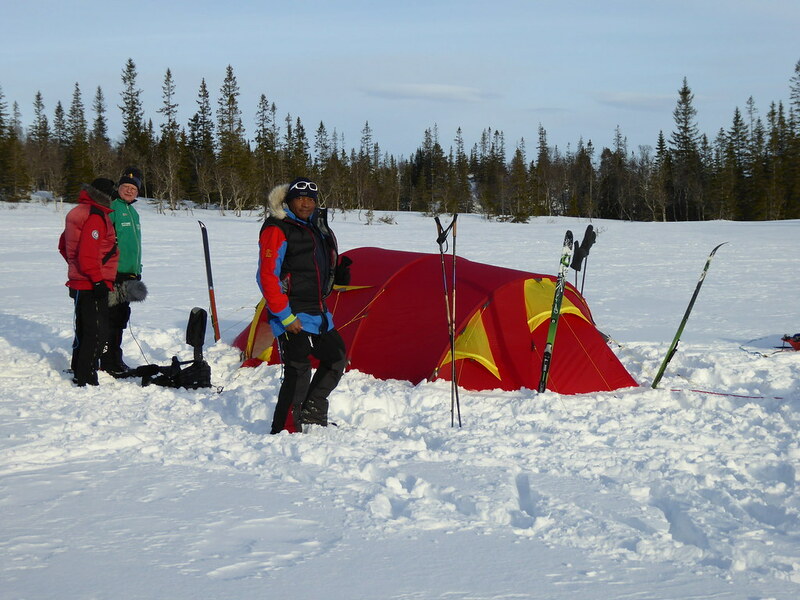 The picture above has been “borrowed” from Arctic Training & Expeditions who organised the trip once I had arrived in Trondheim. All in all it was a great adventure, with the organisation very professional and the accommodation and equipment that was provided first class (despite what happened to the tents!). 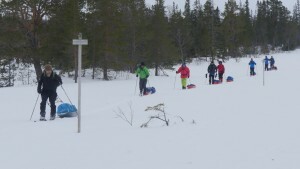 Our guides were Petter Thorsen and Geir Vie. The group I was with was quite diverse too. 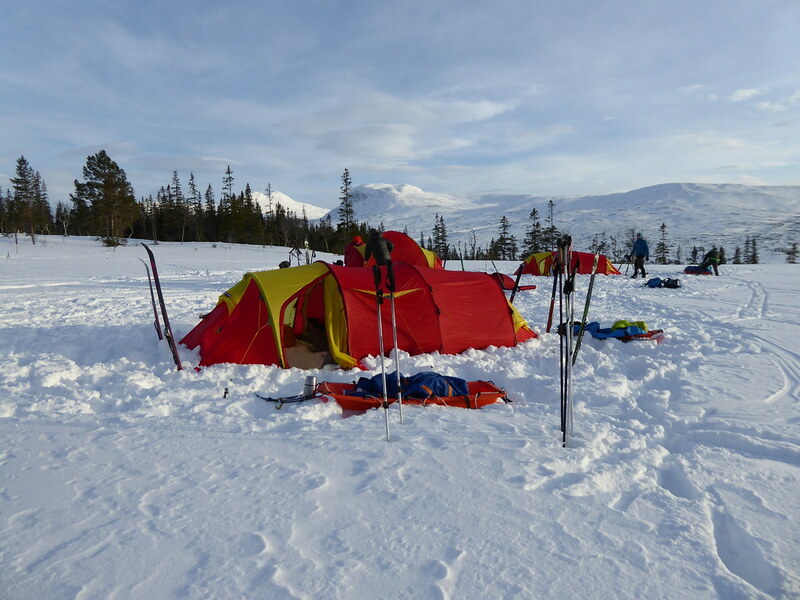 Arctic Training & Expeditions had been recommended to me by Dave Pritt who runs Adventure Peaks (who had arranged my Damavand trip last year and with whom I am going to Elbrus in July). Dave would be on this experience as well. In fact we met at Schiphol and took the same flight to Trondheim. We were accompanied on the journey by Fredrick Bye who is a young filmmaker who trades as Ravnfilm. Within this blog is a link to a programme made by local TV here (note that we are described as “extreme tourists”). 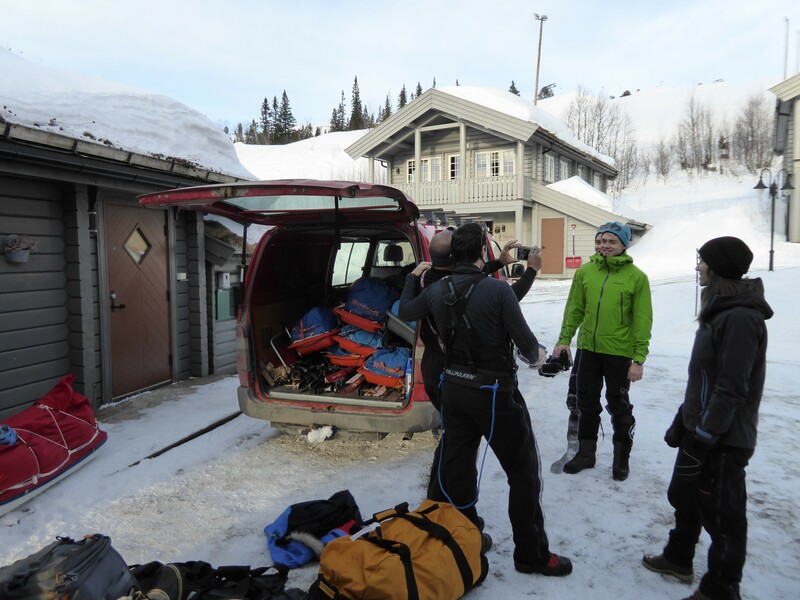 The final footage was shot by Fredrik as the TV crew were with us only during the first day out. Fredrik was very enthusiastic (and energetic as he had to ski to and fro to get shots of us from various angles and distances) and used a drone to obtain the aerial shots. The video at the end is Fredrik’s work. OK, enough of the plugs! The journey with KLM via Schiphol was uneventful. The runway at Trondheim airport juts out into the fjord and, being on the left hand side of the plane, it looked to me as though we were going to land on the water before at the last moment we dropped on to the concrete. Dave and I were met by Petter. 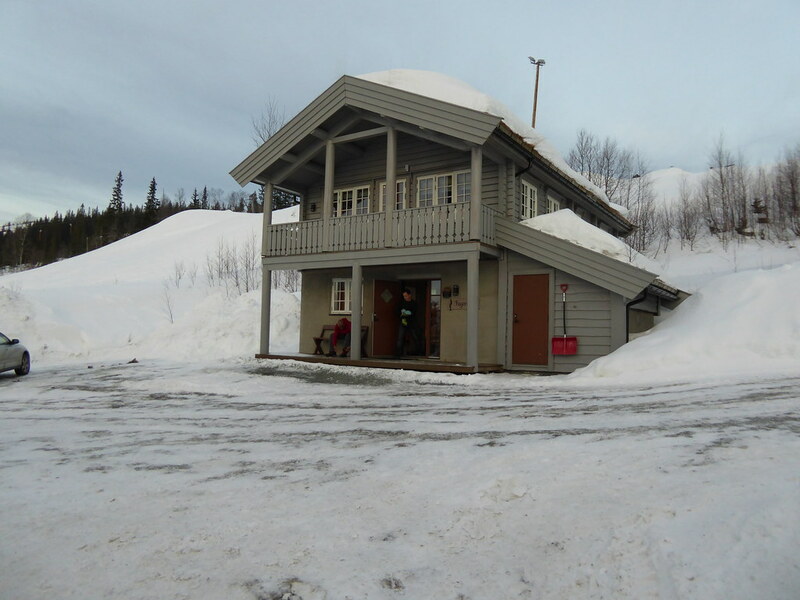 The airport is 12 miles to the east of Trondheim, and the local settlement is called Hell, which invites the obvious quips about being welcomed there. We called in briefly at a gear shop so Petter could do some business. 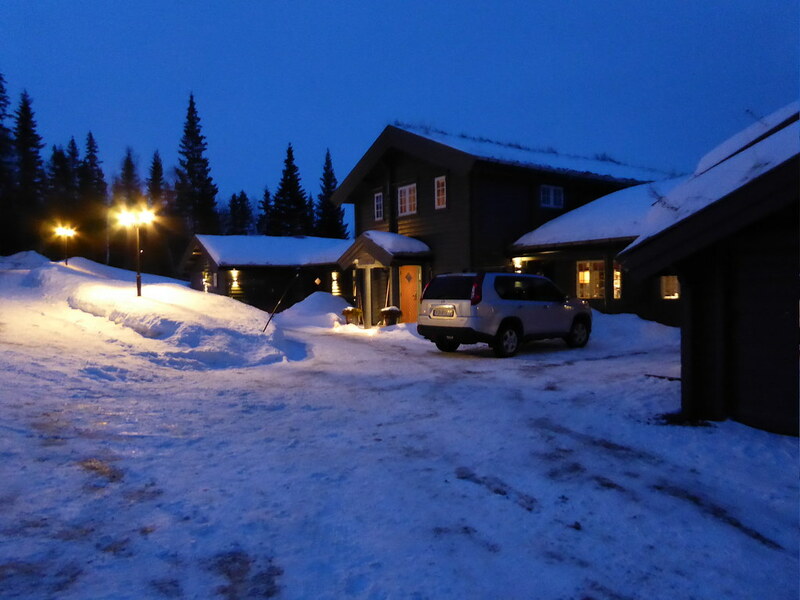 Then we were on our way again for a 40 minute drive further east to Meråker and our accommodation for the first night. 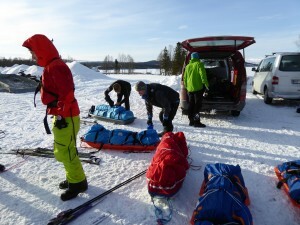 Petter was keen to get our ski legs going. We dumped our gear and met two others who were already there – Darren and Rhodri. We collected skis and boots and were then driven 10 minutes up the road. Darren had not skied before; Rhodri was a regular on this (or similar) courses and I had skied on one day in the previous nine years. My experience was shown up when I promptly fell on my backside as we were leaving the car park – oops! Darren had arrived a couple of days earlier to learn. We spent 90 minutes in the gathering gloom playing around on the skis, in my case fairly tentatively. The skis we were using were touring skis with bindings just at the toes. So catching the edges for turns I found tricky. That evening we had a nice meal of Norwegian specialties. We were joined by Ralf who had flown in from London whilst we were out on the slopes. 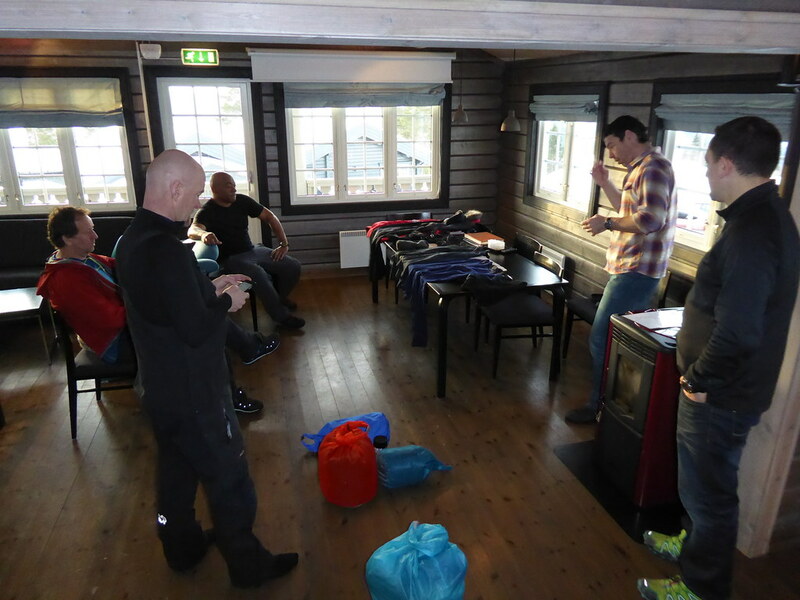 The following morning we had a briefing on what we could expect, a suggested packing list and how to dress. Yes – to dress. In other words, what had been found to work in terms of layering, protection from the elements and how to avoid overheating. The generation of too much sweat can be debilitating if it causes you to chill too much or, worse, freezes on you. 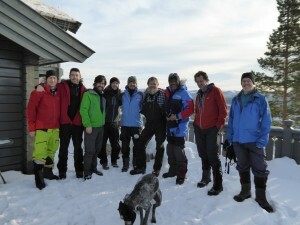 Then it was off to pack our sleds and we were joined by the final member of our team, Chris. Then everything was packed into the back of our transport. And then a final group photo, including Petter’s dog, Stella. 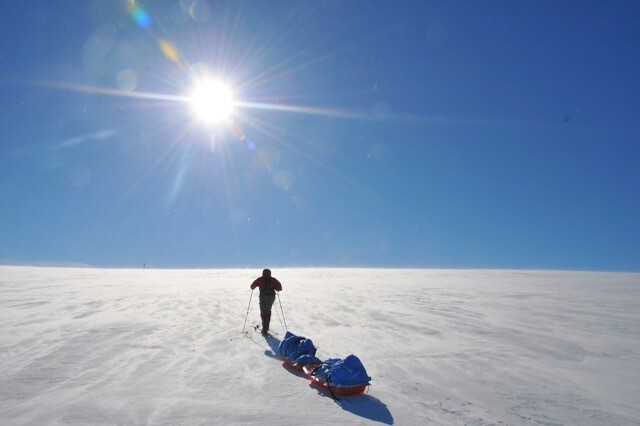 Ralf – who was training to become accepted on a trip to Denali in May. He does ultra-running and in April 2016 completed the Marathon des Sables. Rhodri – a nordophile, who runs an outdoor clothing business and has come each of the last 6 years. 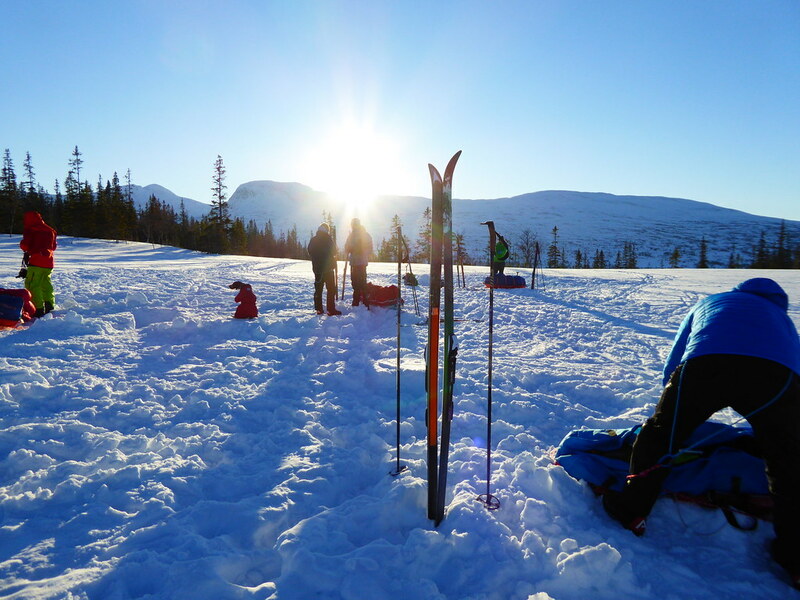 Chris – an American now living in Sweden, who is an executive of the Adventure Travel Trade Association and was coming to sample a course run by one of the Association’s members. 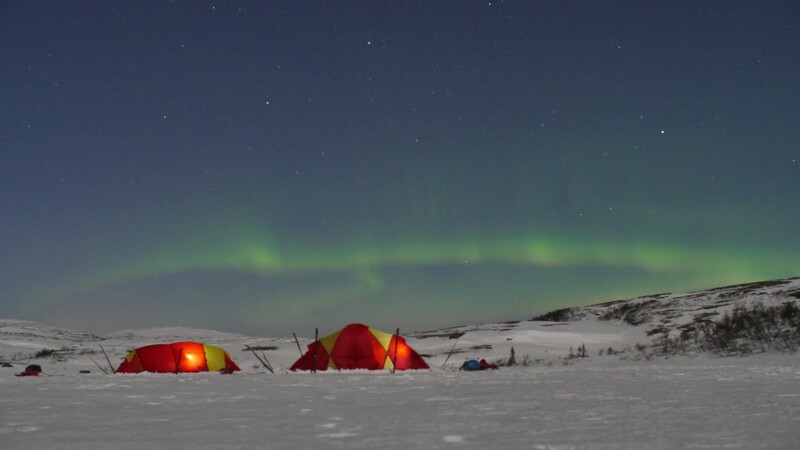 Darren – who is intending to undertake a trip with huskies across Svalbard in May. 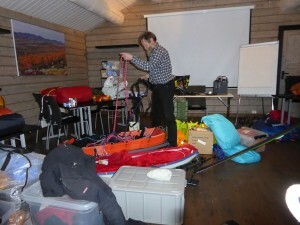 Dave – who was interested in finding out whether this sort of course is something he can offer through Adventure Peaks. After a 45 minute drive nearer the border with Sweden, we parked up by a frozen lake. 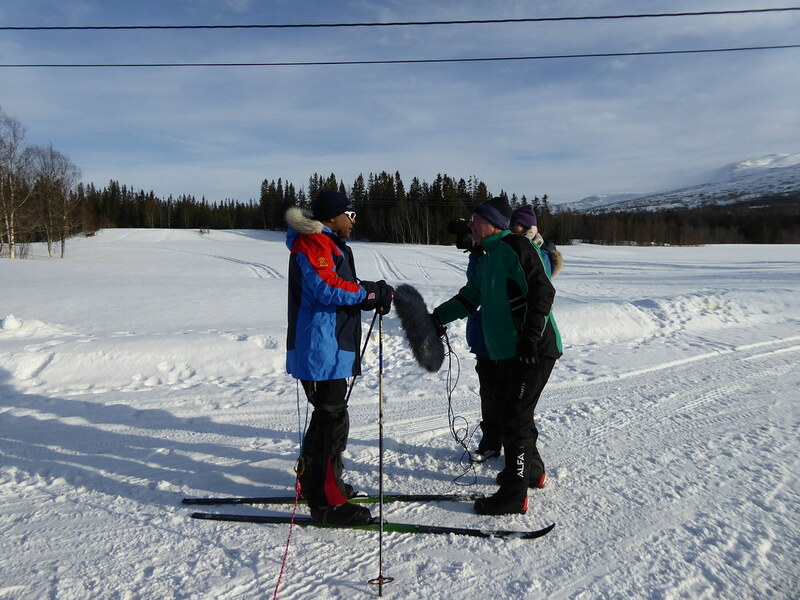 Here we made our final preparations, put on our harnesses to pull the sleds and Darren was interviewed by local TV. Some of the scenery looked Scottish. At stops the Norwegian TV people interviewed most of us. I was spoken to for about 4 minutes. About 1.5 seconds made it through the editing process! The first day was not too strenuous. By 4pm we had found a place to camp, a large level area. We all flattened down areas on which to pitch tents. But once we took off our skis we sank into the soft snow. The tents were soon up. Having pitched the tent, the next job was to dig a pit in the entrance. This served two purposes. The first was to organise one’s water supply – the only way to obtain more water is to melt the snow. This can be a long process because a pan full of snow melts down to a distressingly low amount of liquid. The second, in theory, is that cold(er) air will sink into this area. Soon we all had our tents up. We were then shown how to operate our stoves, sorted out sleeping bags and mats and generally sorted out the tent. Whilst the sun was out, the temperature was probably only around -4C and the air was quite still. Once the sun disappeared the temperature plunged. I was sharing a tent with Dave. Others went to a clearing in the nearby forest, lit a fire and indulged in Aquavit. 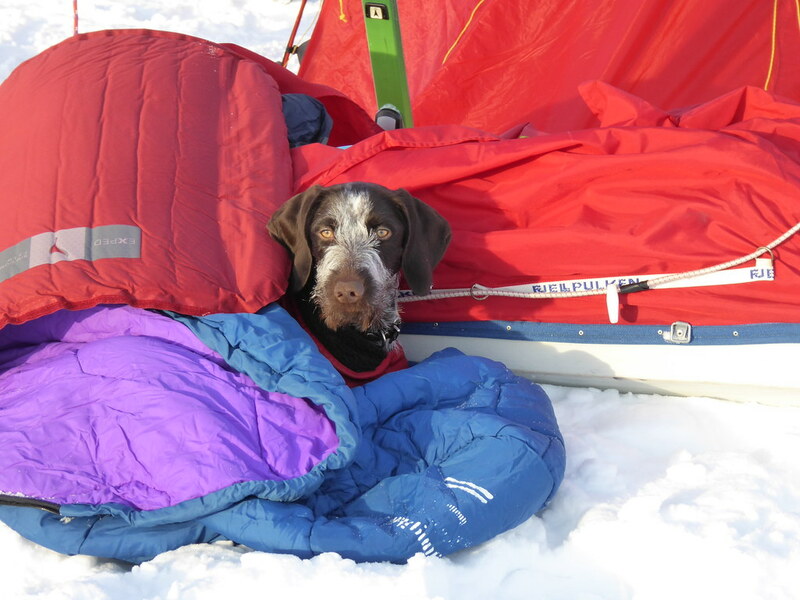 Dave and I preferred the warmth of our sleeping bags. “Cooking” duties were mine. This just meant melting snow, filling thermos flasks and re-hydrating our freeze dried meals. Unwanted water was left in the pan and froze. But actually ice melts more quickly so was used in the morning. Once finished I made myself comfortable and had one of the best night’s sleep in ages. The next morning, the weather was still good. Today was going to be a much longer one over varied terrain. We stopped every hour or so to snack and re-hydrate. 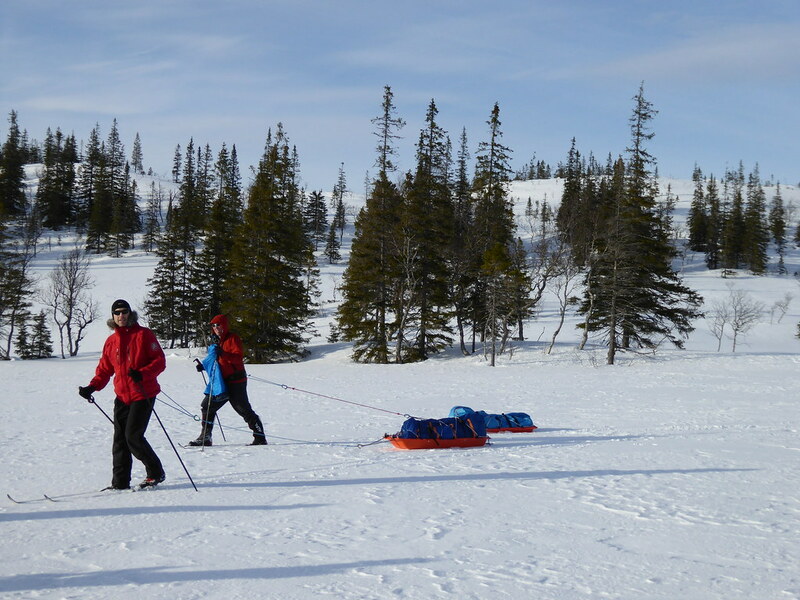 We crossed frozen lakes went over undulating terrain, went downhill so that the sleds tried to overtake you and struggled uphill where the sleds tried to stop any progress. Some of us took turns to pull two sleds. This was more than twice as hard as pulling one. In Fredrik’s film you see me side stepping up one slope. It was hard work! The forecast overnight was for the weather to deteriorate. 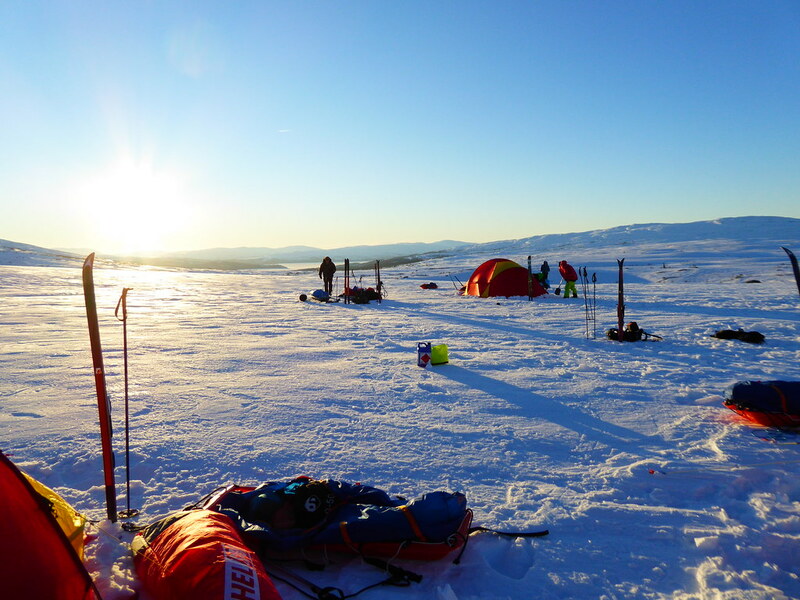 But we reached our camp site with an hour and a half of daylight still remaining. The routine was in place and the tents were up promptly and I dug our pit again. I delegated “cooking” duties to Dave! We settled down for the night. 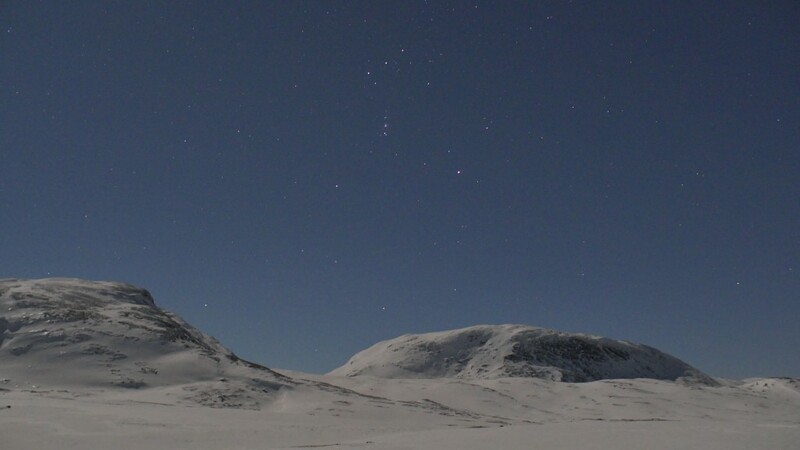 Before the weather changed, Fredrik took these fantastic pictures. Note the Orion constellation in the first photo. 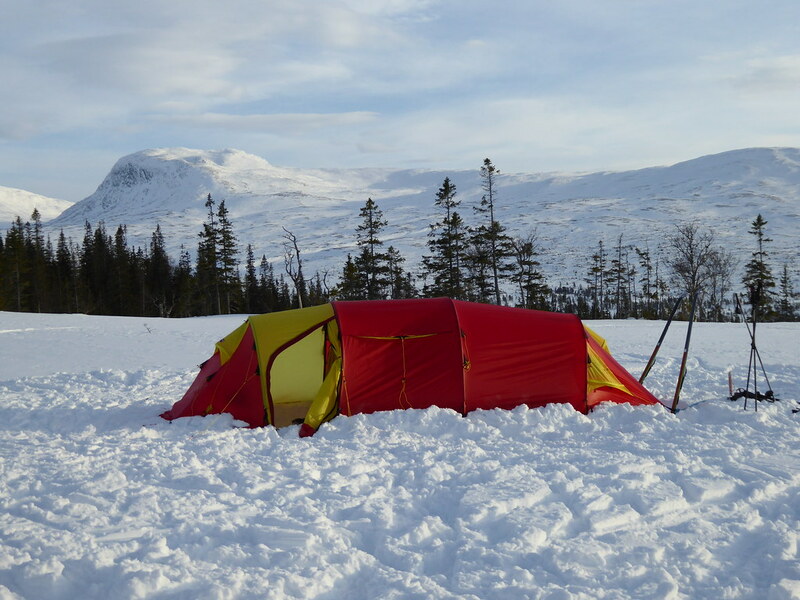 During the night I was aware of the tent beginning to make noises as the wind picked up. At one point Petter opened up the tent and woke me up to tell me that the tent was still sound. I fell back into a disturbed sleep. The wind speeds picked up and I awoke. I lay there listening to the flapping and cracking of the tent. On a couple of occasions massive gusts flattened the tent on top of Dave and myself. Petter re-appeared having checked the outside of our tent again. This time I was already awake. The rest of the darkness was spent waiting for the next gust and wondering if the tent would survive and falling into fitful dozes. It seemed to be doing a good job. We were due to be getting ready at 6.30am but Dave started the stove shortly after 6.00am with first light. We ate our porridge and had warm drinks. The wind was picking up again. We started getting dressed and packing up. 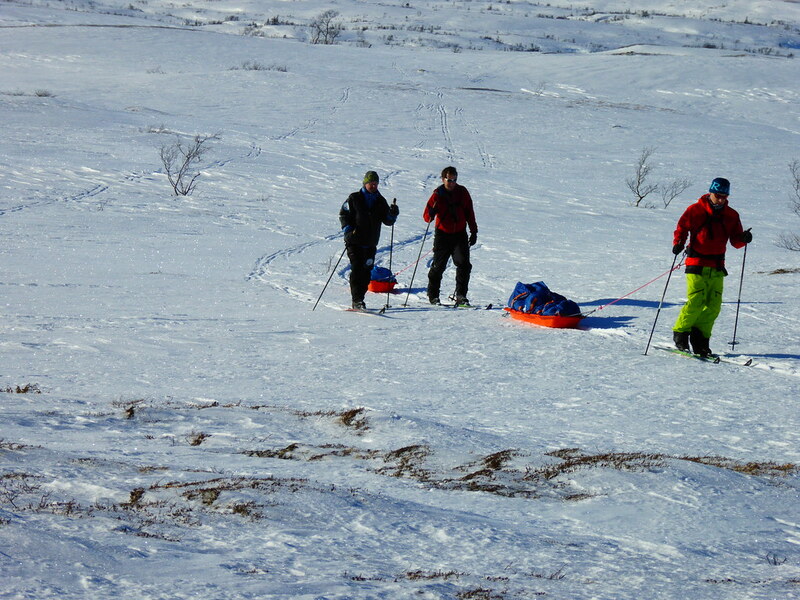 Petter (who had been up all night) passed by and gave us our sled bags, so we could put our gear in there out of the full force of the wind. Dave had managed to put his ski boots on. Just as I was starting to put mine on, the two tent poles near the entrance snapped. Spindrift was now coming in under the valance. It swirled around into my face and into the main body of the tent. All the while I now had my back against one of the broken poles trying to keep the one end of the tent upright as snow went down my neck, into my eyes and into my boots. Awesome! 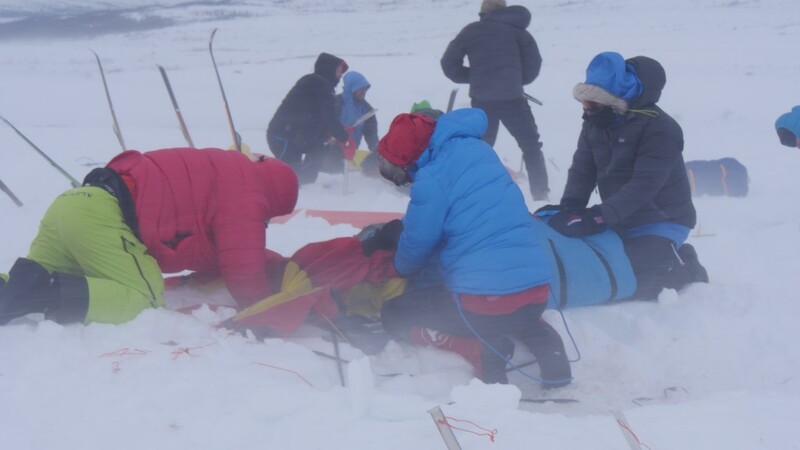 We dragged our sled bags out of the tent. I had to hold down the sled before the bag was put in it and had the weight to hold down the sled. There was now the battle to pack up the tents. All of them had collapsed. I lay down on ours to prevent it from flying away as Dave and Petter folded it up in a manner of speaking. It was then stuffed unceremoniously into my sled bag. The spindrift stung any exposed skin. The wind took your breath away. The others were in their own battle against the elements. I went around picking up pieces of tent poles that littered the tent sites. Some were only a few inches long. Eventually everything had been packed up. It was too windy to ski. So we floundered downhill through the soft snow for 20 minutes until we reached a shallow valley. Here we put on skis. The next half hour I found very unpleasant as my lack of skiing technique was shown up on the rock hard windswept surfaces. 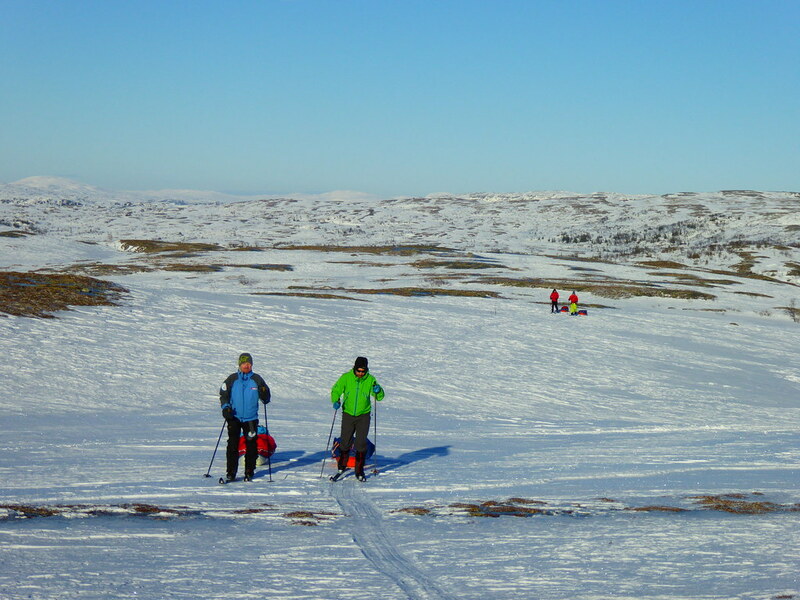 We were skiing on ice, hard snow and through sastrugi (parallel wave-like ridges caused by winds on the surface of hard snow). Whenever we were on a slope the sled shot off with it. So sometimes it was running parallel; sometimes it wanted to shoot ahead or crash into your heels. But despite my inelegance I avoided falling over! 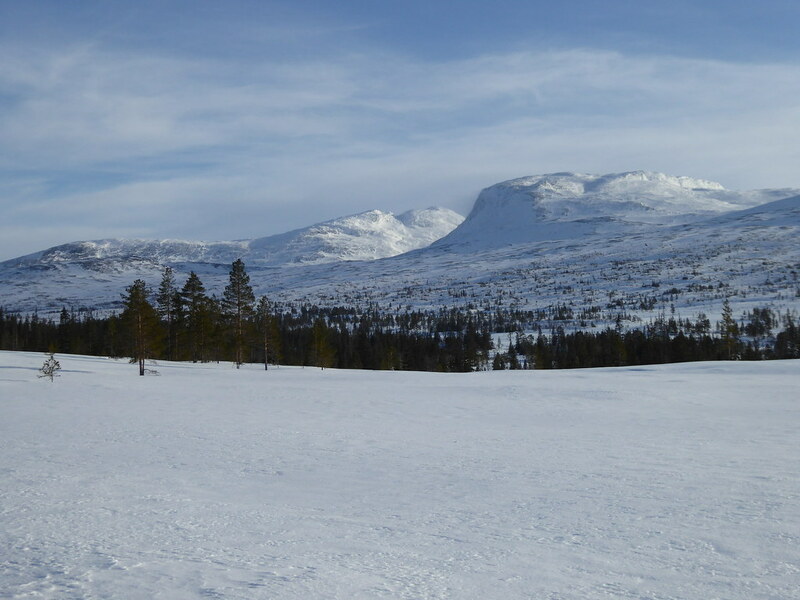 But in while we dropped further and into areas where the snow had accumulated and the skiing was much easier and enjoyable! We finally made it to the forest. So our adventure was over. It was somewhat epic at the end. We resorted to a cosy B&B for our final night and a celebratory dinner which was also excellent. And it was home the next day, spoiled only by a 2 hour delay to my flight out of Schiphol.